-Where was this Motor Parkway bridge located in Suffolk County? Hint: This was a "parkway bridge" where the Motor Parkway went on top of the bridge. 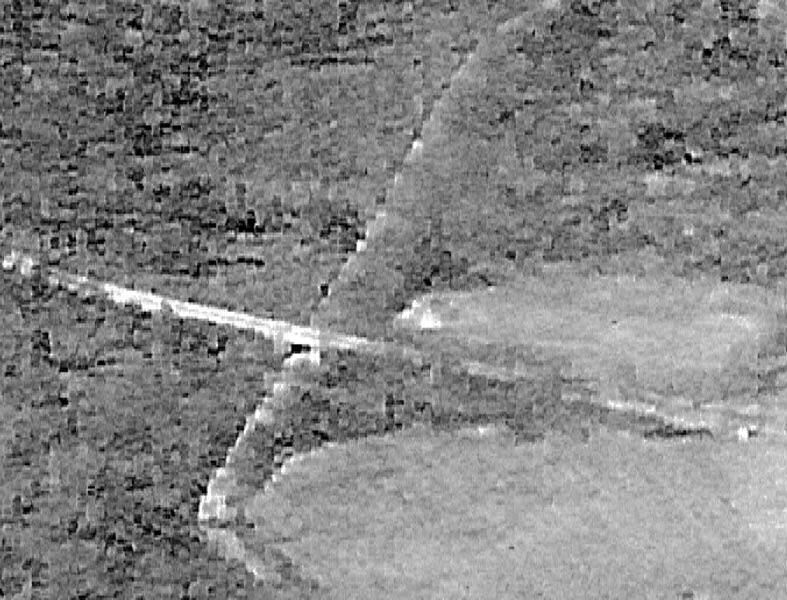 Congrats to Greg O., Brian McCarthy, Tim Ivers, Leroy Douglas, Erci Shaffer and Frank Femenias for correctly identifying the Mystery Foto. 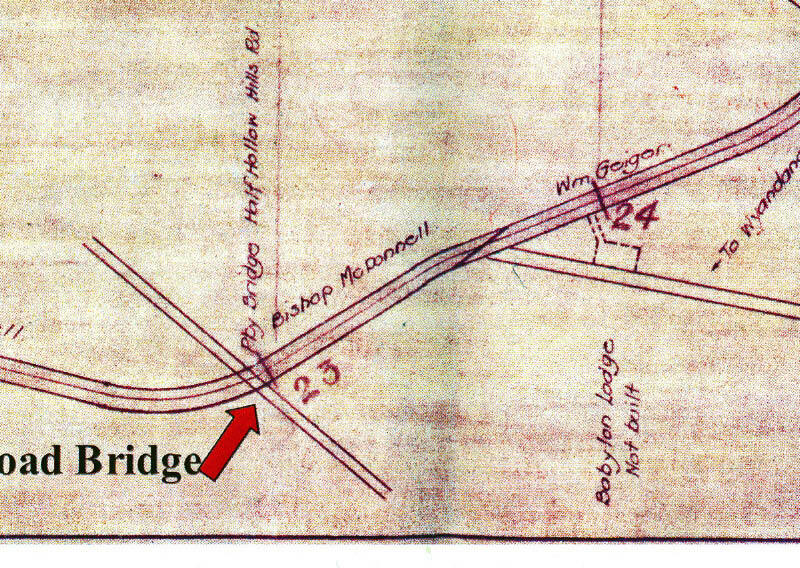 1941 Hagstrom map showing the bridge's location. 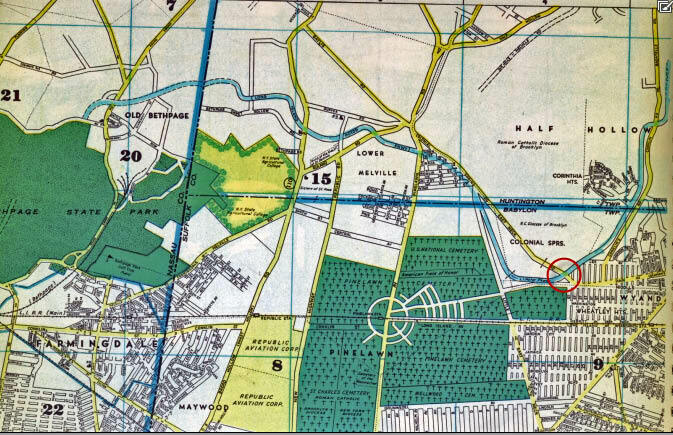 The 1928 Motor Parkway Atlas indicated the bridge as a parkway bridge over Half Hollows Hills Road. 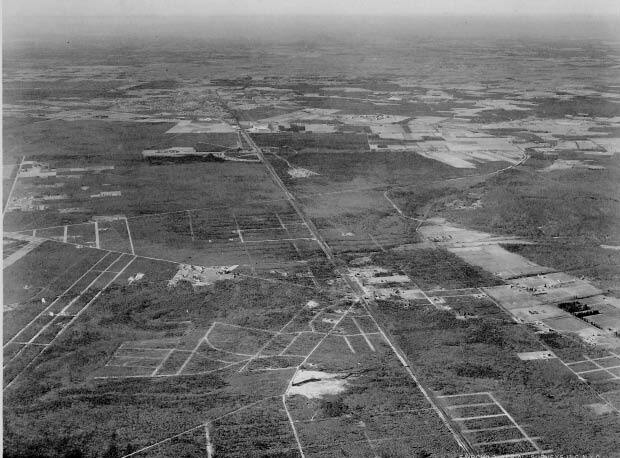 A 1930 aerial of Wyandanch and "West Deer Park". A close-up shows the bridge. 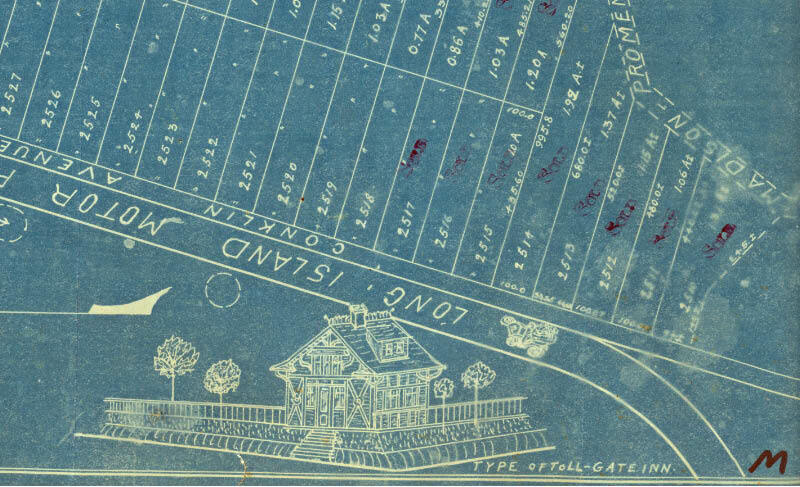 Just north of the bridge, the Bablyon Lodge was going to be built on Lee Avenue. This was a survey schematic of the "toll-gate inn" that was never built. I’ve come across this photo in the past. It’s the LIMP traveling. over Colonial Springs Rd in Wheatly Heights. Pretty sure this photo is from the 1960’s, looking west ; I think. I will research the Madonna Heights School property and post it later this week. Parkway Bridge over Ruland Road. this is the bridge over colonial springs road in deer park/Wyandanch looking east. This could be the Colonial Springs LIMP PKWY Bridge over Colonial Springs Rd in Wheatley Heights, Suffolk. Another possibility is the elusive sister bridge nearby, the Little East Neck Rd Pkwy Bridge. I’m going with Colonial Springs on this one. Any pictures out there of the Little East Neck Rd Bridge? Are you sure that is a 1930s Hagstrom map? - I am guessing that map is from the 1940’s/1950’s. Republic Aviation was named in 1939. 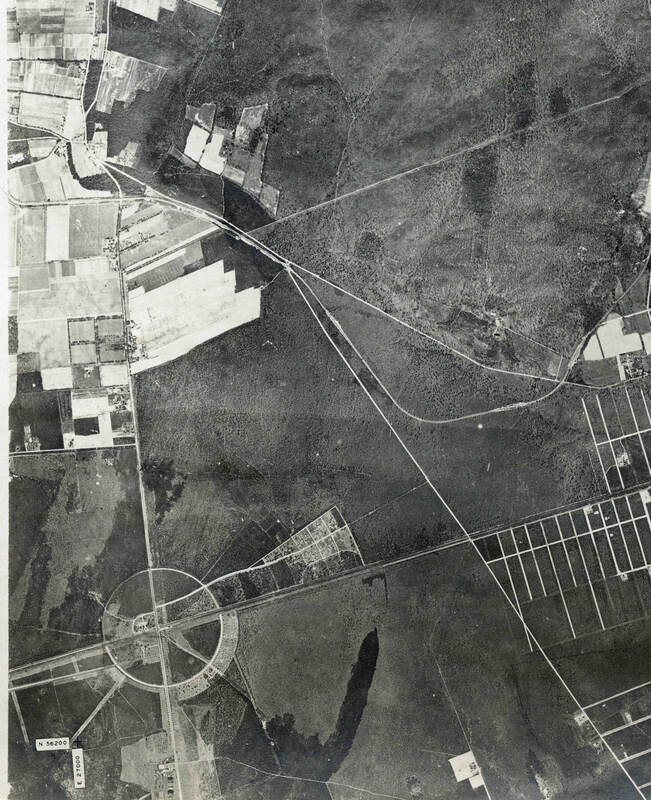 According to Babylon Town Board Minutes: Volume 3: 1909-1915, page 23 in the Babylon Town Clerk’s Office in North Lindenhurst, the Babylon Town Board agreed to allow LI Motor Parkway officials to build two overpass bridges in Babylon on April 14, 1910. “Mr Pardington came before the board on behalf of the Motor Parkway and stated that he would build (the bridges) as requested by the board. The minutes indicate that the bridges would cross Half Hollow Hills Road (today Colonial Springs Road) and East Neck Road (today Little East Neck Road). The April 18, 1910 issue of the South Side Signal (Babylon) reported that: “A.R. Pardington, second vice-president of the Motor Parkway, was again before the board with a petition asking town authorities for permission to place bridge supports twenty-four feet apart on two highways in the northern portion of the town. 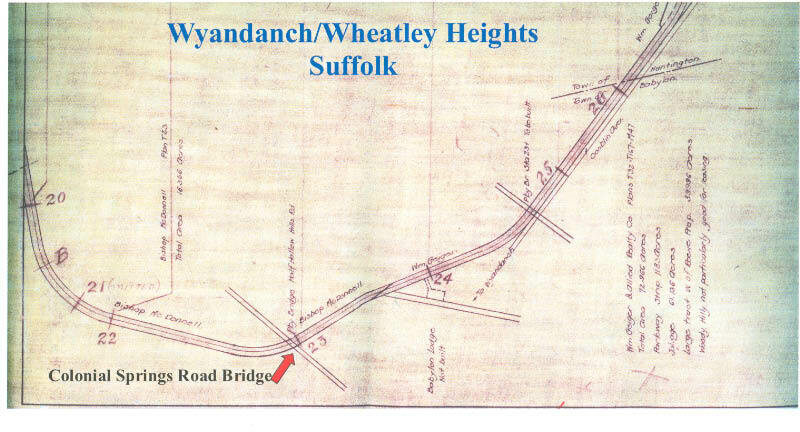 The parkway is to pass through the section of the town near Wyandanch and Mr. Pardington is willing to bridge the highways but does not wish to span the throughfares their entire width. Source: South Side Signal, April 16, 1910: 3. The bridges stood from 1910 until they were demolished by the Babylon Town Highway Department in the early 1960s. I forgot to thank Babylon Town Clerk, Carol Quirk, and her fine staff for cooperating so well with me this morning in providing the Babylon Town Board Minutes: 1909-1915.